Keith will keep you smiling. 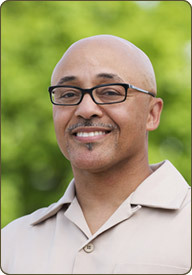 Keith Walker originally trained as a Dental Assistant with the US Air Force, then earned his AAS (Associate in Applied Science) to become an RDH (Registered Dental Hygienist) at Owens College in Toledo, Ohio. He completed additional studies in local anesthesia and restorative dentistry at Pierce College in Tacoma, and all-told, has over 30 years experience in teeth. Keith also reads and exercises, and whenever possible on beautiful days, you’ll find him out on the golf links.